After reading another review here on 5-squared, I became interested in reading this story. 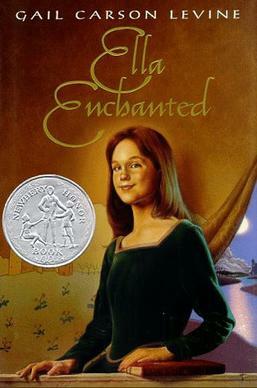 I have a lot of faith in the Newberry Medal winners, and I must say I was pleased with Ella Enchanted. Not following the advice I received from Marcia, I watched the movie first, since I was able to find it at the library, though the books were checked out. Everything turned out fine, fortunately. I had worried about the movie spoiling the plot for me, but decided that one would have to spoil the other and I might as well get it over with. I'm glad to say that as I read the book, I really had no idea what was about to come because it was so different from the movie. There are almost more spoilers in Disney's Cinderella. Originating from the same fairy tale, I liked many of the slight alterations made by Levine, which added to the story well. As many of us are already familiar with such a classic tale, I found the slight embellishments and refinements reflected a keen wit on the part of the author, and kept it fresh and slightly unpredictable. My favorite aspect of Ella Enchanted wasn't the clever alteration to the basic storyline, however. What I enjoyed most was the way in which Levine didn't need adjectives when describing people. Instead, she shared a few lines of dialogue and related a few of their actions and instantly I felt more familiar with the character than if she had come out and stated things about them. It's akin to a picture being a thousand words, or actions speaking louder than words. Something. But the efficiency in her writing was admirable, and the way she chose to have characters reveal themselves to the reader was deftly handled. And yet, I am a hypocrite, for that dark, twisted side is exactly why I hated Wuthering Heights so many years ago. (or was it a stupid female character that should have made some different choices?) To be fair, I was a bit of sheltered sunshine back then, back before life got real. Now I'd probably find it suits me just fine. So maybe I'm not quite a hypocrite, just a split personality divided by a gulf of time. Similarly, I say let the children imagine and dream and read books with magic and talking animals, and then I say let's not delude them with happy endings when in reality existence is so bleak. False advertising and optimism are deceptive and wrong! So do I embrace my irrationality, stop having an opinion, or become more sensible by examining my thoughts more deeply? Probably the first one. It is by far the easiest to just say I don't always make sense and then move on. Well, that aside aside, I still though Ella Enchanted was an enjoyable book. A bit simple in some ways, yet in other ways quite witty and sharp. Example: Ella instead of Cinderella, and Prince Char instead of Charming (wait, I'm still getting there). However, when the prince comes seeking her at the end, they say she is Cinder, just a serving girl. I couldn't help thinking how appropriately Cinder and Char go together. Intentional? I'm not sure. But it seemed clever to take two names, change them, and still find another way to connect them together. I loved the characters, and especially the way Levine describes them without describing them. I found it to be a very fun book. So overall, I believe this to be a perfect book for a younger reader, and a pretty enjoyable one even for older, bitter guys like me. May I just say that I think your review is fantastic and you are quite clever yourself just like Levine as well. I mean I love your quote: "just a split personality divided by a gulf of time." Wow! I say. I liked reading Ella and since I've read it two years ago or so now - I think you've made want to read it again and look for all those little details I missed and you described like "Cinder and Char." That is very clever - intentional or not. I had never connected that before as well as a lot of the other things you said. I also liked your comparison of the movie with the book. I felt the movie was over the top as well. Cinder and Char just have to be intentional, don't they? It's too perfect otherwise! It certainly is really clever. From your review Byron it sounds like this is a perfect example of show-don't-tell writing. Makes me think it's a good book to read for writing instruction. Thank you Julie for the positive comments. It's very nice to receive compliments like that. What a great review of the book. I'm glad you chose the book even though you saw the movie first. The movie was disappointing; the only thing that saved it was Anne Hathaway. I really like her.